While most people rely on their smartphone and apps to get them places, you may have already realized that a proper GPS device is a much better option. A vehicle GPS navigation system has numerous advantages over phones including the fact that they don’t require a data connection and provide you with a greater amount of information. So, with one of these devices on board, you can be quite sure that you will be able to get where you need to go as fast as possible. The tricky part, of course, is figuring out what the best car GPS navigation systems are. Well, you don’t need to worry about that because we have you covered. 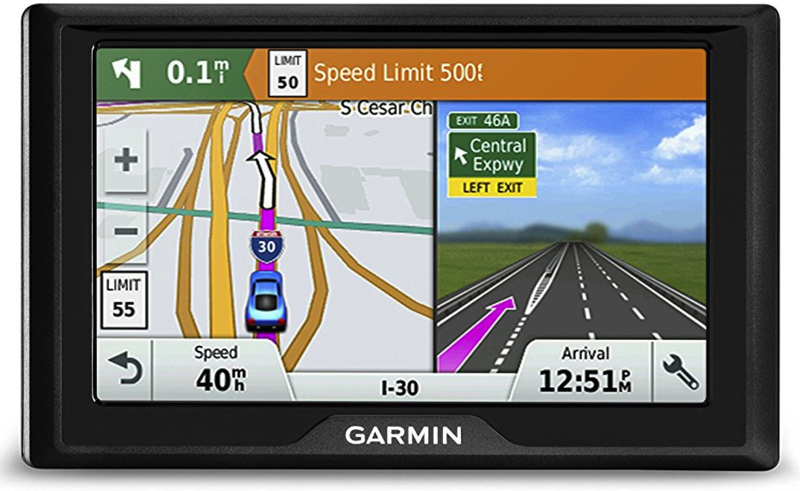 In this guide, you will be able to find a number of GPS systems that will make your navigation a lot easier. We have also included information on how to choose the best one for you as well. Before we unveil the best GPS for your car, we would first like to walk you through the various conditions that we set to determine which options were superior. Map and Directions Clarity: the next thing that we considered was how simple it was to understand both the map on the screen as well as the directions that were being announced to the driver. This determines how easy it is to find your way using that particular system. Additional Alerts: we also looked at whether the GPS provided drivers with any other alerts such as traffic, speed warnings, red lights, school zones, etc. This allows the driver to get around more carefully and safely. Update Features: it is important for your system to update itself every now and then so that you can trust the accuracy of the information that it is providing you with. Why we like it: The MingAo GPS Navigator System is easy to setup and has all of the features that you need to make driving and directions a lot easier. The MingAo navigation system already has pre-installed maps for both North and South America. This makes it incredibly easy to use this device in a variety of countries. Adding to this is the fact that the maps have been designed in such a way that they are quite easy to follow. The graphics are realistic and show close-ups of the roads ahead of you as well as the ones that you need to take. There is also a voice function which clearly enunciates the names of main streets and informs you of when you need to make a turn. You can adjust the volume according to what is comfortable for you. The only minor issue is that it can take some time for you to learn how to work the system. 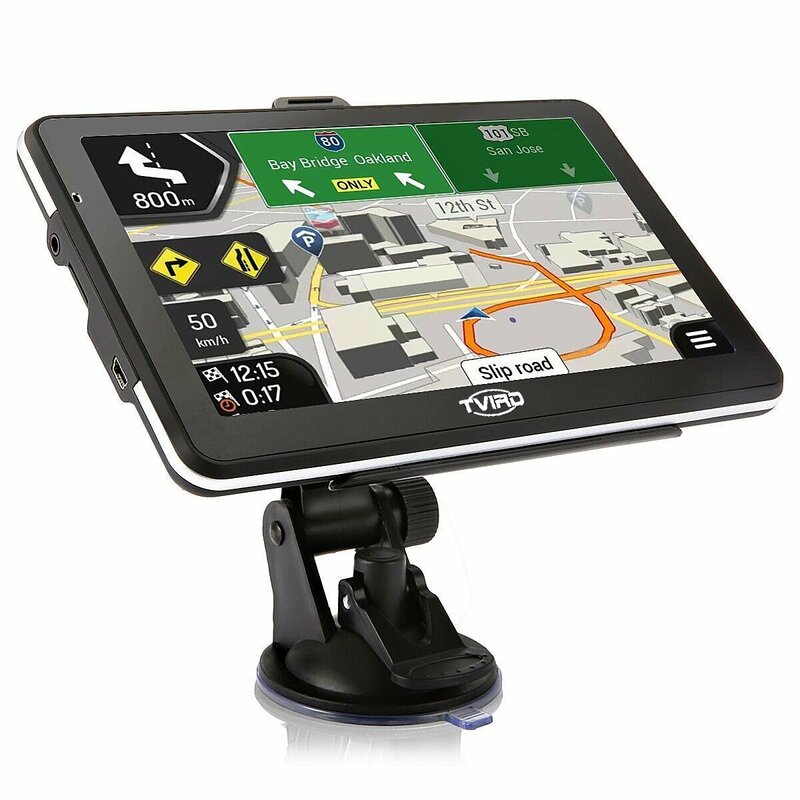 The MingAo device has a nice large screen that makes it easy for you to see the roads and where you need to go with a quick glance. The touchscreen is very responsive so even if you were to make any changes, you can do so with very little delay. Last but not least, the device is equipped with its own sunshade so you can see the screen in both bright and dim environments. This device provides you with a lot of additional alerts while you are driving. For instance, it will keep track of the speed in the zones where you are driving and will tell you when you are entering an area with a school. The device will also alert you to sharp curves in the road up ahead and even tell you where red lights are. 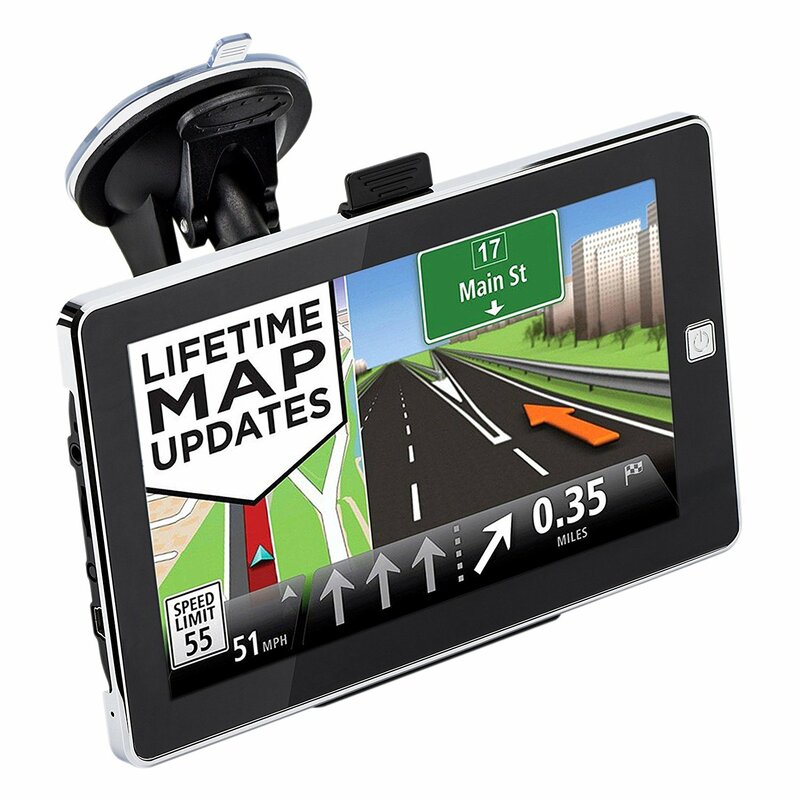 This GPS system is equipped with Lifetime Maps which means that they will continue to update themselves regularly. On top of this, you can also use this GPS device to play your music and even store your photos. 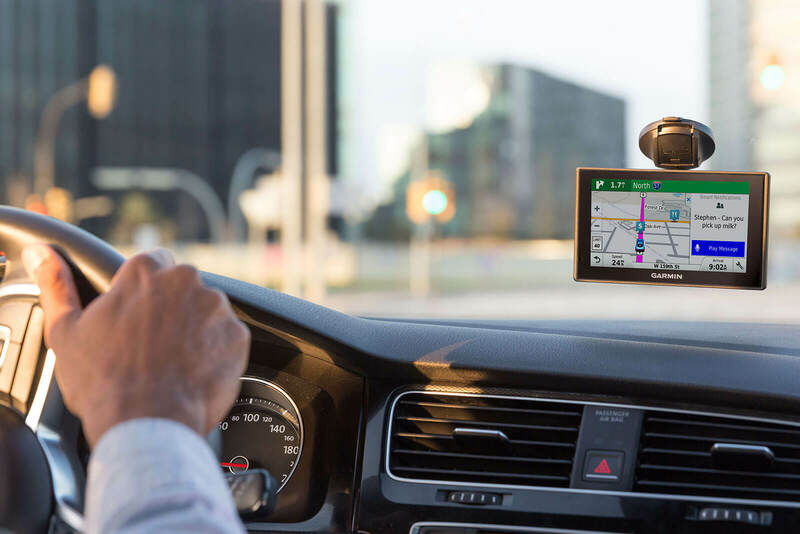 Why we like it: The Garmin Nuvi 57LM GPS Navigator System makes it very easy for you to follow directions to a number of different destinations. One of the things that really stands out about this navigation system is that it is very easy to follow the directions. For one thing, the system does it in a way that you are more comfortable with – it uses landmarks and traffic lights to guide you to where you need to go. This way, you don’t have to keep an eye out for smaller details and risk the chance of getting lost. The spoken directions are also very clear and easy to understand. The system has preloaded maps for 49 different states. This device also makes it easier to look for and find your destination. This is because it uses Foursquare to make it simpler to find popular stores and restaurants all the more quickly. The Direct Access feature of the system means that you will be able to find your local malls and airports a lot more easily as well. The display on this system is a little smaller so some people may find it a bit more difficult to see directions or use the touchscreen. There is also the small issue of the touchscreen not being nearly as responsive as it should be. The good news is that the screen has a dual display which allows you to get two different views of the road you are traveling on. This makes it easier to take notice of immediate turns that you have to make as well as keep an eye on the ones that are coming up. The navigation system continually informs you of the speed limits in any particular zone. It also warns you before you enter a school zone and tells you the speed that you need to lower to as well. This GPS system offers updates quite often which means that you will continue to have up to date information for as long as you are using this device, free of charge. 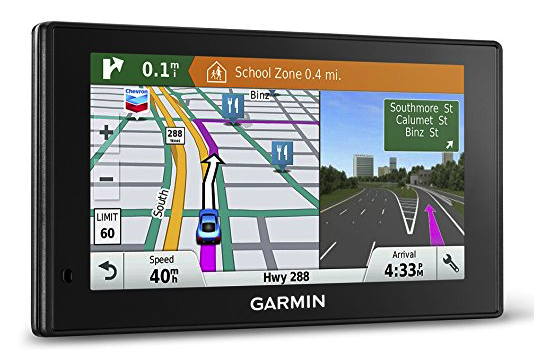 Why we like it: The Garmin DriveSmart 60 NA LMT GPS Navigator System offers the best of both worlds as a navigation device and a smartphone. There is no denying that it is quite easy to take directions from this system. For one thing, the graphics on the display are incredibly clear. The maps are shown in a way that it is easy for you to understand where you currently are and what you need to do next on the road. 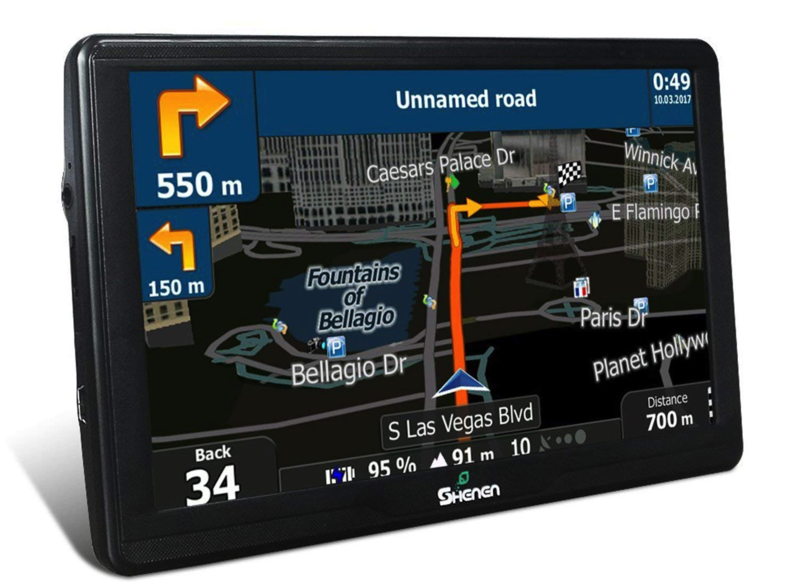 There is also the fact that this GPS offers directions in an easy to understand format. It uses landmarks and similar tools to allow you to find where you are. 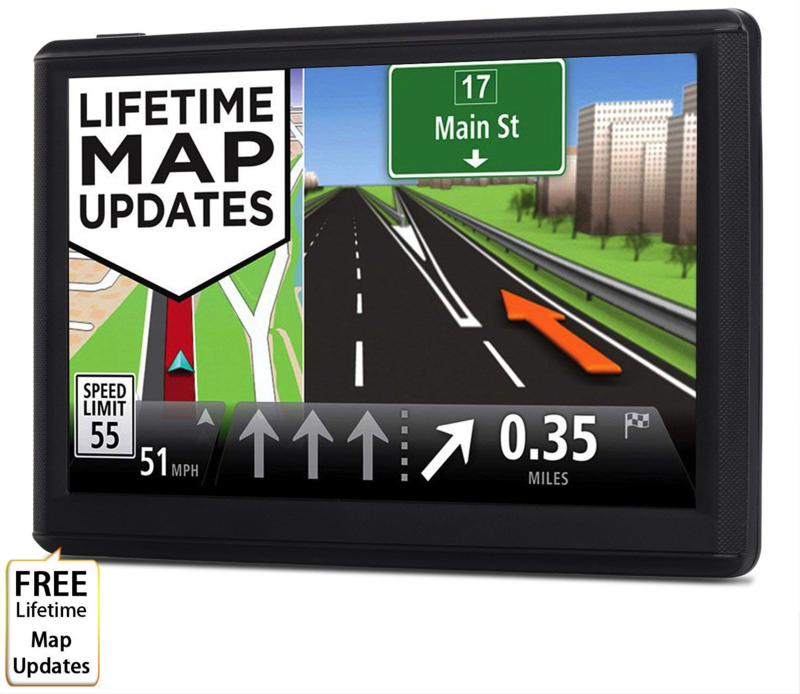 The GPS device comes equipped with detailed maps for all over North America. One of the features that really sets this system apart is the voice command option. This allows you to activate a number of features on this system using only your voice. Now, you should be aware that this is technology hasn’t been perfected and you just might find yourself repeating things. Still, it is a useful tool to have while driving. 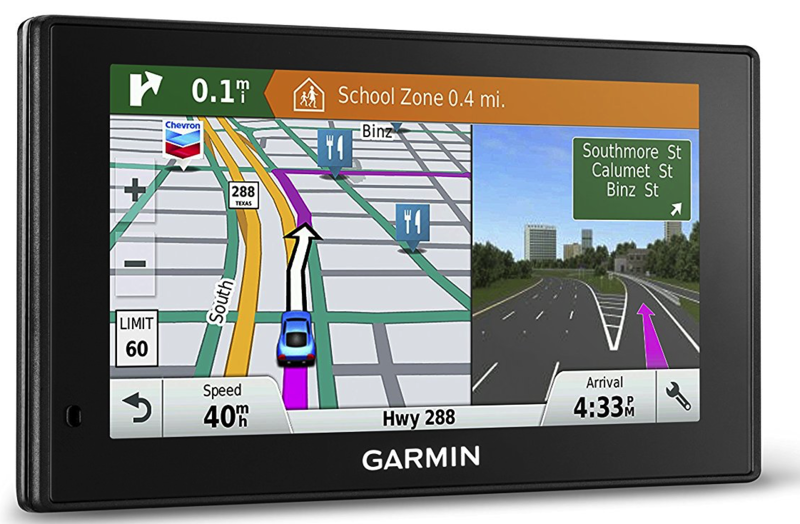 The Garmin DriveSmart 60 boasts a decent sized display at 6 inches. It is also bright and easy to distinguish even in full sunlight. To make it even better, you can actually zoom in on various spots using the touchscreen. There are a number of driver alerts available with this device. These include those for speed, when you are entering a school zone, traffic alerts, sharp curves, and also keeps you informed of what’s up ahead. What’s great about this device is that it also has some of the features of your smartphone. For instance, you can program it so that you get text and phone call notifications while you are driving. You can even get app alerts. What’s great about this navigation system is that the graphics are quite simplistic. Thanks to this, you aren’t overwhelmed with useless visual information. Instead, the road that you are on and the ones that you need to take are clearly marked. Also, if you are at an intersection or are about to take an exit, the device carefully shows you where you need to go. The system has preloaded maps of North America. If you prefer listening to a voice rather than glancing at a screen, then this option is available to you as well. The device uses the car speakers to announce the directions so that there are a lot clearer and easier to follow. The main issue with this system is that it has a tendency to lose the satellite signal, leaving you unable to call up the map for a while. It also doesn’t hold much of a charge and so, doesn’t work all that well for longer distances. The display screen on this device is large enough which makes looking at it for directions a lot simpler. This is especially true if you are trying to take a tricky turn and need a clear picture of what you need to do. The touchscreen is also quite responsive so you can change the settings on the device very quickly. There aren’t too many alerts offered with this model but you do get to know what speed you should be driving at in any given zone. Where this device really shines is with all of its multimedia features. You can play games, listen to music, or even watch movies when you are parked somewhere. You are also offered Lifetime Map updates so that you can be quite sure that any information displayed to you is up to date and accurate. Why we like it: The Garmin Drive 50 USA LM GPS Navigator System makes it a lot easier to find various destinations, particularly popular ones. What is most noticeable about this navigation system is how easy it is to follow directions. This is because the screen is clear and provides incredibly concise directions. The device gets rid of any unnecessary details so you will be able to focus on the road more easily. There are also voice directions if you don’t want to be distracted by a screen. However, what really makes it so user-friendly is the way that it uses traffic signs and landmarks to give you an idea of where you are and where you need to go. So, if you aren’t used to traditional directions, this feature comes in handy. This navigation system is perfect for the modern user. This is because it uses Foursquare to create preloaded and updated maps. As a result, you will have no trouble at all finding popular hangouts. The Direct Access feature also ensures that the airports and shopping malls in your area can be located quickly. It should be noted that, sometimes, this navigator system can only show longer routes and so needs to be refreshed to get the right directions. The touchscreen on this display responds quite quickly to your commands. It also has the additional benefit of offering up a dual, split screen. This way, you can simultaneously see where you are right now as well as being able to see the roads that are coming up later on as well. There are plenty of driver alerts available with this system. You are given notice when there are sharp curves up ahead, when you are going into a zone with a different speed, and where there are red light cameras. The maps on this system offer various updates so that show proper information. However, some of these updates can be lacking for certain areas or streets. One of the features that are most noticeable with this GPS system is the IQ routes. This compiles information from numerous databases to provide you with accurate estimates about when you can arrive at a destination. At the same time, this option can also quickly identify the shortest route that you can take to any place. Due to this, you will be able to avoid arriving late at a destination. Yet another great feature is the Advanced Lane Guidance. This is quite useful when you are trying to navigate a tricky junction or confusing streets. Here, you will be able to quickly and clearly tell when a turn is coming up so that there is no chance that you will miss it. If you are someone that travels a lot, you will find that this GPS is already preloaded with detailed maps of the United States, Mexico, and Canada. This allows you to take this system with you wherever you go, without too much fuss. While the touchscreen on this device is responsive and simple to use, it is quite small. This can make it a bit more difficult to see the directions, particularly when the split screen for the Advanced Lane Guidance is activated. There aren’t too many driver alerts offered by this navigation system but you can see the speed limit on each street and also be warned about blocked roads ahead of time. While this system does allow you to update your system quite frequently, there can be a few difficulties involved. It can actually be a while before the updates actually take. It can also be difficult to determine just how long this device will last after purchase. Why we like it: The HighSound Navigation System has plenty of features to make sure that all drivers will be able to find their way around. If you are someone who finds it difficult to read typical maps, you are going to really love what this system has to offer. See, it uses clear and simple graphics to point the way out to you. The visual directions are also very obvious and you will always know exactly what lane to turn into. The audio instructions are also similarly clear as an alternative. What really stands out about this system, though, is the 3D navigation option. This makes the landmarks around you appear as three-dimensional structures on the screen. As a result, you will have no trouble at all finding your way around since all of the details are incredibly accurate. Yet another interesting feature is that you can download external maps onto this system. It has 8GB of storage, specifically for this purpose. So, if you are someone who likes to travel in and out of the country, you will find this quite useful. You should know, though, that this isn’t the easiest system to use and does have a learning curve. The display is quite large on this device which means that you will be able to see all of the information on the screen quite easily. It even comes with its own sunshade so the display will always be noticeable, regardless of the time of day. There are various different driver alerts available to you with this particular system. You will be warned of speed cameras and red lights. You will also be informed when there are speed changes up ahead or if there are sharp curves coming up soon. School zones are also mapped out for you. The system can be updated a few times a year which allows you to ensure that all of your information is on the nose. Why we like it: The SHENEN GPS Navigation system contains a lot of maps and simple directions which makes it easy to use all around the world. The graphics on this navigation system are quite good. This is part of the reason that you can use it to find your way around. All the details, landmarks, and buildings are laid out quite well so you can always know where you have to go next. While there is also a voice that gives out directions, this doesn’t function nearly as well. For one thing, the directions tend to cut off, mid-sentence. What does make up for this is the fact that it is equipped with intelligent route planning. So, it will map out a route that allows you to get to your destination in the shortest time possible, avoiding numerous obstacles along the way. Another feature that is quite impressive with this system is that it is preloaded with maps of North and South America. It is quite easy to download other maps as well. 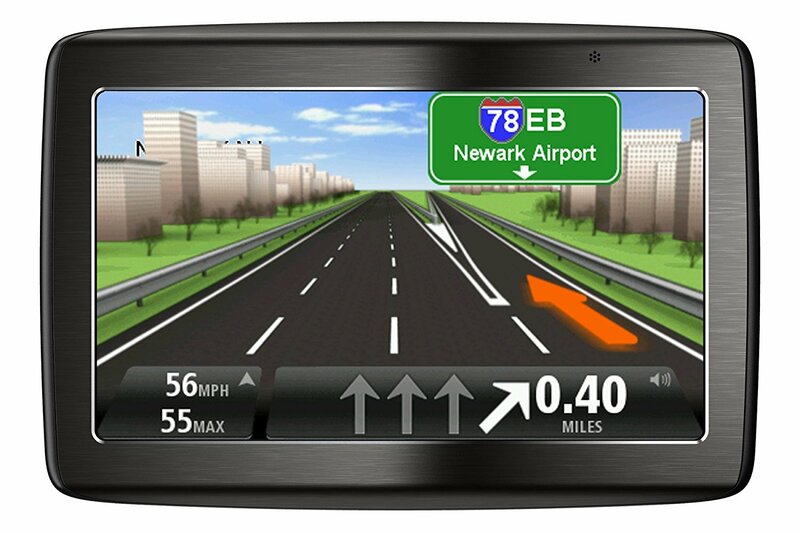 So, wherever you go, you will be able to know that this navigation system will come in handy for you. The display on this device is rather large which makes it quite easy to see. This is quite useful considering that the voice feature doesn’t work all that well. The display is incredibly responsive allowing you to type in locations or instructions quickly. The two main driver alerts available with this system are the warnings for speed limits and frequent announcements of your arrival time. Not only are there lots of maps to choose from with this device, there are also different language options. Furthermore, you can update the system quite easily too. 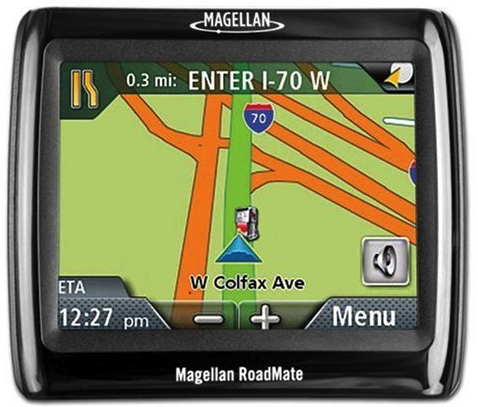 Why we like it: The Magellan RoadMate 1200 GPS Navigator is a compact device that is simplistic and easy to use. If you are looking for a navigator that is fuss-free and simple to use, then this is the one for you. While the device itself is rather basic, this does mean that you will not get sidetracked by any unnecessary details or features. Instead, the system will simply lay out exactly where it is that you want to go. If there are some places that you like to frequent more than others, you can simply use the OneTouch search icons for quicker results. You don’t just get to enjoy visual directions. If you don’t want to have to keep glancing at the screen then you can simply turn on the audio feature which clearly enunciates all of the street names for you. There are also preloaded maps of the US, Hawaii, and Puerto Rico. If you tend to travel from city to city quite often, you will find that the Smart City feature is quite useful. It allows you to quickly narrow down which destination you want to go to, depending on the region you are currently in. You will also be able to plan multiple stops along the way, without experiencing any hassle at all. The main problem with this navigation system is the fact that it doesn’t inform you when it has lost connection with the satellite. Instead, you will simply find the screen freezing on previous directions and may even not know that something is wrong. Now, the Magellan RoadMate is compact enough for you to slip it in your pocket and move around. Unfortunately, it also means that you have to read the directions from a very tiny display. When you are driving, this can be quite difficult to do. There are no driver alerts available for this system. This is a very basic unit without any real, additional features. 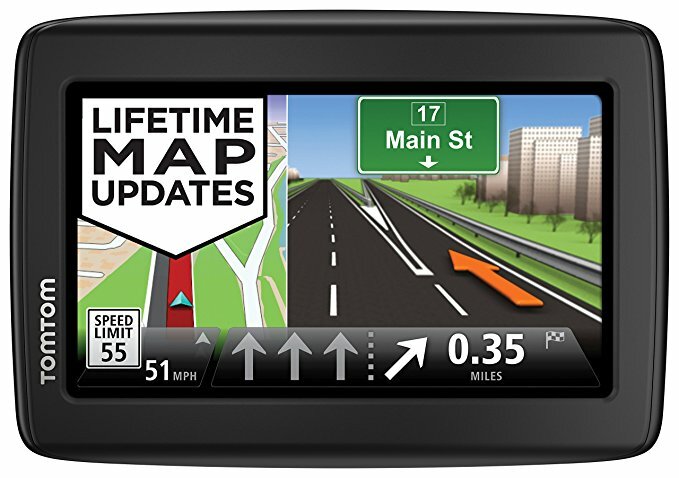 Why we like it: The TomTom VIA 1535TM GPS Navigator offers lots of ways to make navigating while driving a lot easier for you. If you are someone who doesn’t find traditional maps on GPS systems to be all that useful, you are going to love how this GPS works. This is because it gives you a realistic view of the road you are driving on. This includes the paths that are coming up. Due to this, you will find it easier to figure which lane or turn that you need to take, lessening the chance of you making a mistake. This device is also equipped with IQ routes which ensure that you are provided with up to date information on the state of the roads. It also calculates the fastest route to any particular destination, making sure that your journey is as fast as possible. To make it even simpler for you, the navigator contains points of interest for your city. So, if there is a famous or popular spot, you will be able to find it more easily. Now, this navigator is equipped with a voice activation feature. Unfortunately, this doesn’t work so well as it doesn’t understand you most of the time and can get addresses and other details mixed up. You may find that it isn’t all that useful. The screen on this device is a bit small and so you may find that it is a bit difficult to discern smaller details. However, the touchscreen is rather responsive and you can change the settings easily. There are a few alerts available with this system. You will be informed of any new speed limits, as you go from one zone to another. You should also be told of any blocked roads that may appear on the map. This device has Bluetooth hands-free calling as it can connect to your smartphone. This way, you can take your calls without having to take your hands off the wheel. The system is also able to provide you with frequent updates but the process can be rather tricky. Your GPS is only as good as its ability to pick up your location and any other locations by connecting to a satellite. For the GPS to have a constant signal, it needs to have a sensitive receiver. Otherwise, you will find yourself losing the connection and waiting for the system to scramble to get its bearings. It should be noted that this is nearly inevitable with most systems at one point or another. Still, the best GPS systems will ensure that this happens only occasionally. This may seem like such a minor factor but it is only once you begin to use your GPS that you will realize just how important it is. For one thing, the size of the screen will determine just how well the map can be seen at any given moment. If the screen is large, the map will also appear to be clearer. A bigger screen ensures that all the details on your map don’t have to be squeezed together but instead can be spread out so they are more distinguishable. Also, the size of the screen is relevant as most GPS models these days have touchscreens. If you have large fingers, you will find it quite difficult to get any of the settings right on the screen. Of course, it doesn’t really matter how big the screen is if the resolution is poor. Look for displays that offer clarity so that you can see all of the details and text properly. The truth is that most people focus on the audible instructions issued by the GPS. After all, if you are driving and don’t have a fellow navigator, it can be difficult to glance at the screen. This is why you need to make sure that the audio is just as quick as the visual details. So, you should be issued instructions as soon as they are needed. Also, the instructions should be detailed so that you always know exactly what you should be doing at any given moment. In that vein, it is also important that you understand what the computerized voice is saying at all times. This is especially true for strange street names that can be difficult for computers to pronounce. Let’s face it, even with the best GPS system on your hands, you are bound to make a few false turns. When this does happen, your GPS should be able to reroute itself immediately. It will need to then tell you a new way to get to your original destination. This way, you will not end up more lost than you already are. It is a good idea to arm yourself with a GPS system that is able to plan the shortest route to any destination. This means that the system should be able to analyze all the routes that you can take and calculate which one will take you the least amount of time. On a similar note, you should be able to quickly and easily figure out popular locations in your city. This could be a famous restaurant or a frequently visited location. Either way, the GPS should be able to get you there without any issue at all. Many GPS systems come with preloaded maps, often corresponding to where you live. The main benefit of these maps is that they don’t take as long to load. So, you will be able to figure out just where you need to go without waiting for the system to calculate a route. Of course, these maps are only as good as the updated versions. So, you should look for a system that offers you frequent and free updates to keep it fresh. Even if there are only a limited number of preloaded maps, you will still require a system that offers updates so that new changes can be taken into consideration. The great thing about modern GPS systems is that they are able to provide you with a whole lot of information. So, it is important to look for a device that can provide you with up-to-date alerts. Now, what these features are, depend on what you are looking for the most. Some people want to be notified of speed changes as they go from one zone to another. This is particularly important in school zones. Others want traffic updates so that they can avoid congested areas. Or, they want to know about red lights so that they don’t have to wait for too long. Some drivers prefer to be told about speed cameras so that they can avoid fines. So, you should figure out what is most significant to you and choose a device with those features. Some of the newer models will boast about voice activation features. These are supposed to let you issue audible instructions to the system and have it respond. While this is a nice idea, it is important to understand that this technology is quite new. As a result, it isn’t all that reliable. So, while it may be a fun idea, there is a good chance that it will not live up to your expectations. Some GPS models have various entertainment and multimedia features. They can let you listen to music, watch videos, and store your photos. If this is something you are interested in, then it is a good feature to have. However, these aren’t vital features so it shouldn’t be the first thing that you look at in your navigation system. This concludes your search for the best car GPS navigation system. Hopefully, you have learned a lot by now and are able to make your own decision regarding what is best for you.